- Single motor synchronizes conveyor, star wheel & platform turret. - Production Rate : 60 to 150 bottles/ min. Bottle Height: 52 mm to 210 mm. We are offering Semi Auto Cap Sealing Machine. The offered machines are developed using superior quality material and latest techniques in conformity with set industry standards. - Parts coming in contact with the container or the Plastic Screw Cap or exposed to the atmosphere are made out of Stainless Steel for long life. - Single Motor synchronizes Conveyor, Star Wheels and Platform Turret and the speed can be varied by VFD. 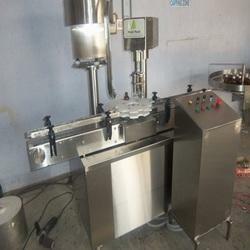 Ambica Pharma Machines Pvt. 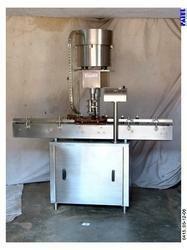 Ltd.
Automatic ROPP PP Cap Sealing Machine Multi Head. "GMP" Automatic ROPP Cap Sealing Machine is versatile, self-supported on stainless steel leg with height adjustable adjustment system. The machine is precision built on sturdy welded steel frame completely enclose in stainless steel sheet and doors are providing to facilitate the servicing of machine. The semi automatic cap sealing machine is precision built on sturdy welded steel frame completely enclose in stainless steel sheet and doors are provided to facilitate the servicing of machine. Machine is motorized incorporating rotating threading & sealing rollers, for threading & sealing of ROPP cap. Electrical Motor**: 1 HP / 440 Volts / 3 Phase / 50 Hz (Four wire) For Main Machine. Backed by rich industry experience and market understanding, we are involved in offering a wide array of P P Cap Sealing Machine to our valued patrons.